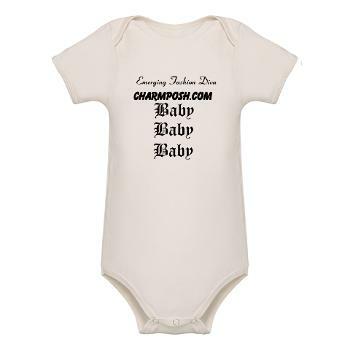 Our emerging fashion diva onesie is so cute! Made of soft organic material and comes in pure white. A must have addition to your stylish baby girl fashion that is ideal to mix and match with skirts or baby designer jeans. Also this bodysuit goes perfect with any color or pattern TuTu skirt! The CharmPosh bodysuit will make your little angel feel very special every time she wears it. Protect your baby’s tender skin with this ultra-soft organic cotton bodysuit. Free from pesticides and other harmful chemicals, this comfortable, earth friendly creeper is made from 100% certified organic cotton.